Cattails have some benefits in ponds and lakes, but they reproduce quickly and leave behind a lot of waste. Cattails belong to the genus Typha, which consists of approximately 30 species worldwide, all of which are classified as semi-aquatic flowering plants that typically thrive in marshes and the edges of lakes and ponds. These plants can spread quickly, able to reproduce by dispersing seeds via wind as well as growing from a shared rhizome, or underground stem that is similar to a root. In some cases, what appears to be hundreds of cattails may actually only be a handful of individuals sprouting from the same rhizome or group of rhizomes. This means that cattails are able to very easily colonize wetland areas, outcompeting many other vegetative species early on. This isn’t necessarily a bad thing, as cattails provide valuable habitat, food, and nesting areas for wildlife and have been found to help naturally remove pollutants from water. What are the Most Common Cattail Species? Only 2 cattail species and native to America, and not all species are native to all regions which can cause issues as they spread. Three Typha species are commonly found in North America – the broadleaf cattail (Typhus latifolia), narrowleaf cattail (Typhus angustifolia), and southern cattail (Typhus domingensis) – but the National Park Service states that only the broadleaf and southern cattails are deemed native. The narrowleaf cattail has become a significant and challenging issue in the Midwest region, particularly within the Great Lakes Basin region of Michigan, Indiana, and Wisconsin. It is not yet known just how it came to North America, though scientists suspect it moseyed its way over with European settlers in the 1800s. As with other cattail species, narrowleaf reproduces quickly. Because it is not native to the region, the flora and fauna in these areas has not yet adapted to be able to keep this plant in check or properly compete with it for space and resources, and so it often chokes out the native plant species along the ecologically unique and critical Great Lakes shorelines. This in turn damages wildlife that depend upon those plant species, and has a ripple effect as many wildlife species in the Basin are migratory and travel around North America and other portions of the world. What About Cattails in Garden Ponds? In your garden pond, you may (or may not, depending on your particular goals) desire cattails to be present. As mentioned previously, they do provide habitat, shelter, and food for many creatures, including the fish in your pond, birds, insects, turtles, frogs, and so on. They also provide some degree of natural water purification, soaking up lead, excess phosphorous, other nutrients, and biological waste from the critters that have made your pond home. However, cattails multiply easily and quickly, and so you may wish to either eradicate them completely or take actions to control their spread to prevent them from choking out your pond and its inhabitants. Using gloves to manually remove cattails is probably the simplest method. To safeguard the health and integrity of your pond ecosystem, natural cattail control methods should be explored first. The most straightforward method is to simply pull them out by hand, ensuring that you pull up the white root-like rhizomes as well. Pull slowly from the base so as to not break the plant, since they can possibly sprout from any intact rhizomes. Depending on how many cattails are present, this may be a slow method, and can stir up the sediment in your pond and cause murkiness that could impact your fish. However, the sediment will settle after a day or two and the cattails can simply be tossed aside and will naturally compost back into the earth. The durable reeds could also be used to make mats or furniture, and historically Native Americans ate the tuberous, nutrient-rich rhizomes by boiling them and mashing them up like potatoes. This method is both one of the easiest and safest methods for removing cattails in smaller garden ponds, but may be too much work in large-scale lakes or natural bodies of water. Cutting can help stunt the growth of cattails, reducing their ability spread. Another effective strategy is to cut the cattails below the surface of the water with shears or a gas powered tool like an aquatic weed whacker or hedge trimmer, as the water will act to slow photosynthesis and growth by filtering some of the sunlight and reducing oxygen availability. When using this method, make sure to cut in mid to late summer (July or later), as cutting them in May will actually stimulate their growth since they are already allocating most of their energy to spring growth and will simply resprout. Repeat this cutting two or three times, and each year you should see markedly fewer cattails returning. If you have a large number of cattails or they continue to grow faster than you can cut them, we recommend a mix of both pulling (as above) and cutting to reduce their spread. If you simply want to remove them completely, removing the entirety of the root is always the best solution as cutting will just stunt their growth temporarily. Basic pots can be used to restrict the growth of roots, but the heads will still need to be removed annually. If you wish to have cattails in your pond but control their spread, you could place them in pots and then position them in your pond – they prefer water that is two feet or less in depth. Ceramic or clay pots work well, but will need to be heavy enough to stay put underwater. The pots will prevent the spread of their rhizomes, though the plants will still reproduce via seed dispersal. Simply cutting off the heads of the cattails before they go to seed (while the heads are still brown) will thwart this. You will have to throw away the heads to prevent the seeds from persisting in the ground, as cattail seeds can remain dormant and viable in the soil for as long as 100 years. With enough annual and persistent cutting of the heads of cattails, along with having them in restricted pots, you should notice much less aggressive spread from year to year. Adding salt to water will eventually kill cattails, but is not recommended in ponds with fish! Fish and Wildlife Service and Department of Natural Resources conducted various studies that found a salinity of 10 parts per thousand during the growing season is enough to kill cattails. With this in mind, you could increase the salinity of your pond by simply placing a salt block directly within the mass of cattails in the spring, or using pond salt solutions, and then removing it once the cattails have died. If you live near a natural saltwater source you could also attempt to flood seawater into your pond or lake. The obvious downside of this method is that your pond likely contains freshwater fish and plant species, and as such, they will not be tolerant of significant salinity increases. This method is only recommended for ponds and lakes without freshwater fish or significant freshwater plant coverage, as the heightened salt levels will likely kill most species. Freezing cattails in winter, removing roots, and draining the pond water is an affective removal method. In the event that your cattail population is too extensive for the above methods, you could either completely drain your pond and allow it to freeze over the winter, which will kill the rhizomes, or dredge up the soil to fully remove any rhizomes and slumbering seeds. However, both of these approaches would require you to move your fish and other pond inhabitants indoors or to a different pond, or fully restock your pond the following spring. If you only have a small number of koi, or smaller goldfish, a stock tank can be used to house fish over winter (with proper filtration added) while the main pond system freezes over and dries out during the winter season. Fish can then be added back in Spring after you have re-filled the pond with fresh water and started up the equipment again. If you have a very heavily stocked pond, you can instead attempt to drain the water down to the level of the cattails, and then manually dig them from the embankments. This still has the problem of leaving seeds in the soil, and will also cause a huge amount of mess in the pond, so fish should still ideally be moved to a holding environment regardless. I Have Too Many Cattails – What About Chemical Solutions? Reward – A landscape and aquatic herbicide. If none of the above methods work, there are also comerically available chemical options for cattail removal. Common aquatic herbicides include Rodeo, Aquapro, and Reward. These are designed for large-scale use in lakes, and we do not reccomend them for smaller garden ponds! Reward is a contact herbicide that must be sprayed directly on the plant and is listed as being quite potent, killing all plant cells that it comes in contact with. Aquapro and Rodeo are both liquid glyphosate herbicides that are systemic, meaning that they are absorbed into the plant and work their way through every part of it, including the roots. Systemic herbicides act more slowly than contact herbicides, but are more effective as they impact the plant’s entire system and will thus kill the whole plant, rhizomes and all. In any case, make certain that you are using herbicide that is listed as aquatic, as these are designed specifically for aquatic plants. In many areas, it is illegal to use non-aquatic herbicides in aquatic environments, and in others you may need to obtain a permit from an agency such as the Department of Environmental Quality to apply the herbicide. Regardless, always do your research before utilizing chemicals! 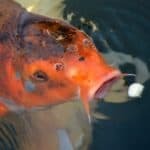 Will Aquatic Herbicides Kill My Fish & Plants? As you might suspect, any chemical designed to kill something has the potential to adversely impact other organisms as well. This could include directly killing both plants and animals, causing sterility and birth defects in animals, making them sluggish and sick, damaging other plants, bioaccumulation in your pond’s inhabitants and other wildlife that visit your pond (which then travel to other areas and may be consumed by predators, leading to further bioaccumulation), and even leeching into the surrounding soil and water table if your pond is not lined. In addition, cattails that die will need to be manually removed from the pond. If left, the process of decomposition will lead to excess nutrients in your pond and deplete oxygen, which in turn may harm your fish and fuel algal growth. Due to this, for use in garden ponds, we feel aquatic herbicides should always be a last resort – especially if you have fish! If your pond isn’t lake-sized, you should be able to control cattail growth sufficently with the natural methods outlined above in this article, without harm to fish, plants, or wildlife. We live in North Central Texas and have stock tanks for our cows. A few years ago cattails started growing in one of our tanks. It was a small area at first but has been increasing each year, until now it is almost covered. There are frogs, turtles and fish in the tank and we are adverse to chemical methods of control. This year we have been in a drought situation and now the pond has gone completely dry. There is no aquatic life left and the cattails have almost all died. There is still some green and there were a lot of seed pods. Most were completely intact. The last few days we have completely cut the plants to the ground, removing the seed pods intact first and putting them in bags and into the trash. There were a few laying around that had burst but we felt we would have to deal with that later, pulling them individually as they come up. We have just begun digging up the rhizomes with a backhoe but it is very tedious and it is also disturbing the base of the pond – digging up the clay in chunks. We are planning to completely remove the rhizomes after digging them up. 1. Will the rhizomes die soon if the plants are completely removed down to the ground? We may get some rain tomorrow that will help moisten them and keep them alive a while longer. 2. The tank will eventually fill again. Will the rhizomes die after it fills without vegetation on top? 3. Or, is it best to keep digging them up and hope the clay will settle back after the tank fills. Thanks for your comment and questions! Apologises for the delay in replying. Speaking from experience, I can tell you no matter how well you think you’ve removed the majority of cattails, more will probably sprout in future. When cattails have spread this extensively, it’s more often than not a battle of attrition, which can take several seasons of cutting and dredging to fully resolve without extensive herbicide use. However, in your situation, you luckily have the advantage of being able to get right to the rhizomes directly! If you really want the cattails gone, dredging them up is definitely more effective than cutting. Cutting the plants below the meristem (above will actually encourage growth!) can be effective, but it’s still no guarantee they won’t return next season. If you do decide to dig up the soil, the clay should settle fairly quickly when the pond re-fills, and it shouldn’t cause any major issues with wildlife. After dredging the soil and removing rhizomes, for maximum effectiveness, you can also consider using a weed burner to apply a ‘controlled burn’ to destroy any seeds left in the top layers of sediment. If you’re working with a large area (more than a typical weed burner can handle), you may need to request a burn permit from the Department of Environmental Quality or contact a professional to help. In either case, I do hope you manage to get those cattails under control! Cattails have taken over my pond . I have a lot of fish in the pond and my cattle drink from the pond . What do you recommend so as not to harm my fish or cattle . Could I ask how large the pond is? Also, what fish do you currently have in there? In general, when cattails have grown extensively, and when herbicides are not an option, the only way to really remove them is with A LOT of manual work (seasonal dredging, pulling, cutting etc. ); often over several years.